Somebody who is standing right beside me at the moment is naming this ring "The Globe". Thanks ODD, that's her name. Now I have Twice Around the World and The Globe. Maybe I should add Green Planet. Wow! Talking about Globalisation!!! This was done last Sunday. 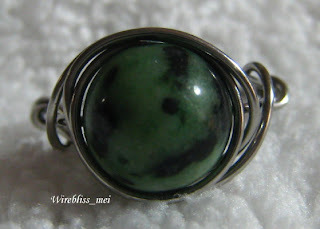 I still call this "Green Stone" because up till now I still do not know what kind of stone this is. The guy who sold me this said its a type of "rock" - *scratching my head*. The ring is quite big - Size 17. I used 20g stainless steel wire for the wrap. Made for someone's aunt. I see exactly why you have named it 'The Globe'. Your wirewrapping is very good - I like the fluid curves on the shoulders of the ring.